Brewer’s Reserve No.3 has spent 800 days gently maturing in old Auchentoshan whisky barrels, the longest maturation period of any of the Brewer’s Reserve beers. The beer draws notes of vanilla, honey and spicy ginger from the whisky-soaked wood, combined with a rich malty body. Many thanks to Erzengel for sharing! A hazy dark orange golden beer with a huge most good lasting off-white head. Aroma of strong red malt, wood, tart fruits. Taste of strong red malt, red fruits, wood, tart fruits, grapes, slightly boozy. Bottle from my cellar. No. 14213. Great deep and woody nose. The beer starts intense and deep. Fruity with woody parts, long and deep caramel. Malt and wood, not too much wood, the whisky is peated in the back. Fruity parts of plums and dry peated whisky. Not too intense, very mellow, round and smooth. Nice. Bottle from Systembolaget, bought in February 2012. Best before was Dec 2014. Hazy amber with a large head. The aroma was tart with oak, dried fruit and malt. Similar taste, also some whisky and more oak. Lively carbonation and with a medium carbonation. The tartness was a suprise, a bit too old bottle perhaps? Bottle. Poured with a small head. First flavours where apple and ginger followed by maltiness. Disguises its strength well. An excellent beer. Bottle. 9.0%. Bottle No. 02083. Best before end 2014. Pours a hazy, deep amber/light red with a light tan head. Bit of lacing. Tart, almost sour, fruity aroma; almost lambic-like. Notes of berries and faint strawberry. Malt as it warms. Flavour is fruity and feels bit fat. Remote hops in the background. Bitter, slightly tart, wooden finish with a distinct whisky note. Lingering grassy note and a mild alcohol burn. Too much carbonation. Overall okay as such, but with some flaws; the tart/sourness feels misplaced (is it eve nsupossed to be like that?) and the high carbonation is a distraction. 12.03.14. (Bottle) Dark amber colour with huge, foamy off-white head. Malty, fruity nose with notes of caramel, oak wood, honey, vanilla, dried fruit and hints of roasted nuts. Malty, fruity taste with caramel, dried fruit, oak wood, honey, nuts, toffee, spices (cinnamon, nutmeg) and a balanced spicy bitterness in the finish. More than medium body, with a certain sweetness. Fairly sharp carbonation. Quite a gentle whisky character (well, Auchentoshan is quite gentle), but with lots of oak wood and a slightly peculiar bretty touch. 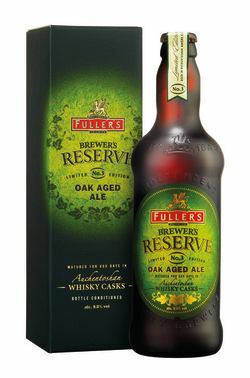 Interesting, not the best special version from Fuller’s, but quite nice. 500ml Bottle - Copper/dark amber in colour. Dried fruit, leather, caramel, whisky and some musty notes in the aroma. Fruity, rich, malty and warming taste with notes of whisky, vinous fruits, oak and caramel. Rich and one to sip. I have to say that I preferred the first two editions of this series, but this one isn’t bad. 500ml bottle [#04610]. Clear copper colour with average to huge, foamy, fairly lasting, minimally lacing, white head. Floral and herbal aroma, cautious hints of fruit, a soapy touch. Taste is minimally sweet malty, floral notes, hints of toffee and mint, in the finish hints of the whisky, a dry woody touch; effervescent carbonation. Too strong carbonation prevents a better degustation of probably present flavours. Bottle #08373. Deep copper color, off-white head. Raisins and floral notes in the aroma. Cognac-like finish (whisky barrels, I know!) that lingers with an oily mouthfeel. Strange "Fisherman&apos;s Friend" vibe throughout. Full body, medium-high carbonation. Not as good as the previous iterations.